Ribbon is a great way to add a variety of different colours. They can be sewn to table runners, hung from ceilings or wrapped around vases or backs of chairs. Different tables can be assigned a colour each or bring all the colours together on a table to create a big impact. They are an effective way to tie all your decor together with a rainbow twist! Origami is another great (if not time consuming) way to add some colour and a statement feature to your wedding. A hanging centre piece or a little favour for each of your guests if you have the time (or hire me!) is a great way to add some personality. So some final few things to consider. The cake! I am sure you are all familiar with these fantastic hidden rainbow cakes to really give your guests a surprise during the cake cutting. Invites are also a great way of adding a rainbow element perhaps, more subtle way. Using a gradient lettering is colourful and just a bit sophisticated, this can even be used for decor touches such as a guest book, menu cards or place names. 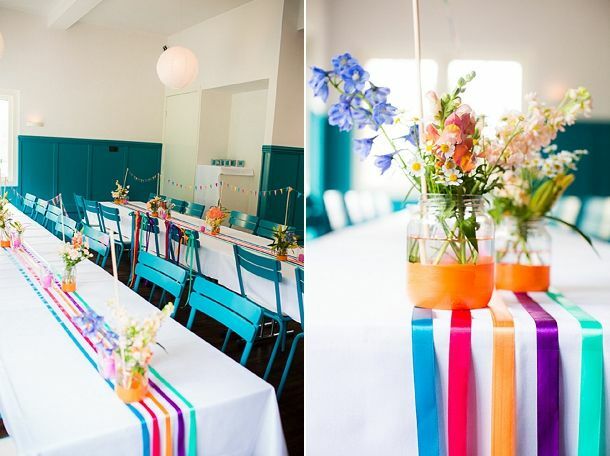 Want Rainbow styling for your wedding? Contact me using the form below. I want rainbow styling for my wedding!